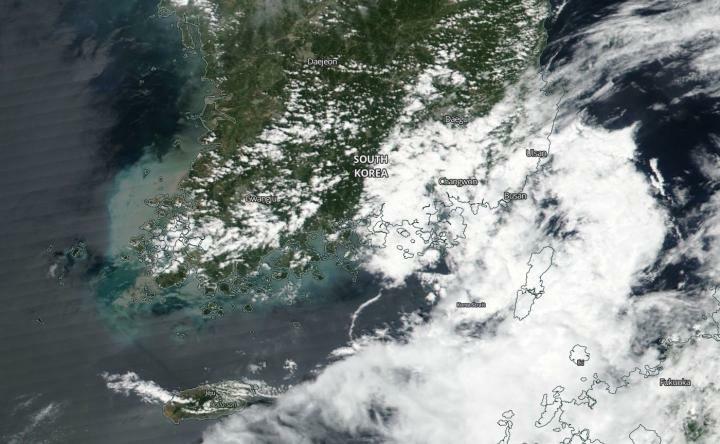 Tropical Depression Leepi was nearing landfall in southern South Korea on Aug. 15, when NASA-NOAA's Suomi NPP satellite flew overhead. The Visible Infrared Imaging Radiometer Suite (VIIRS) instrument aboard NASA-NOAA's Suomi NPP satellite captured a visible image of Leepi a shapeless Tropical Depression. Limited convection and clouds are being pushed to the south of the center from northerly vertical wind shear. On Aug. 15 at 5 a.m. EDT (0900 UTC), the Joint Typhoon Warning Center reported the center of Tropical Depression Leepi was located near latitude 35.3 degrees north and longitude 129.7 degrees west. That's about 19 nautical miles southeast of Busan, South Korea. The depression is moving toward the north-northwest. Maximum sustained winds were near 34.5 mph (30 knots/55.5 kph). Leepi is expected to be absorbed into a mid-latitude cyclone by Aug. 17.